by Pernul, Günther, Tjoa, A.M. 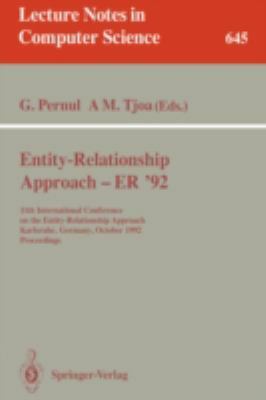 This volume comprises the proceedings of the Eleventh International Conference on the Entity-Relationship Approach held in Karlsruhe, Germany, October 7-9, 1992. It contains the full versions of all the 22 accepted papers selected from in total 64 submissions; in addition, the two invited talks by Scheer and by Tsichritzis and others are represented asfull papers and the two other invited speakers contribute extended abstracts. All the contributions describe original research related to theoretical or practical aspects of the Entity-Relationship Approach,reflecting the trend of recent years in a wide range of database research activities. In particular, the topics database design aspects, object-orientation, integrity constraints, query languages, knowledge-based techniques, and development of new applications are addressed.Pernul, Günther is the author of 'Entity-Relationship Approach - Er'92: 11th International Conference on the Entity-Relationship Approach, Karlsruhe, Germany, October 7-9, 1992 - Proceedings', published 1992 under ISBN 9783540560234 and ISBN 3540560238. Loading marketplace prices 142 copies from $4.99 How does the rental process work?